What Happens When An Airplane Stalls? Why Do Airplanes Have Swept Wings? What Are Trim Tabs on Airplanes? 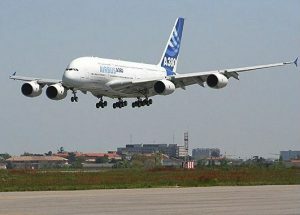 The Airbus A380 has become one of the most talked-about jets in the commercial airline industry. The massive double-deck jet has only been available for a few years. In that time, however, it’s attracted orders from several major airlines, including Emirates, Singapore Airlines and Lufthansa. But even if you’re familiar with the A380, you might be surprised to learn the following facts about Airbus’ popular jet. Airlines looking to add the A380 to their operational fleet must be willing to make a hefty investment. Statistics show that the wide-body jet costs $445.6 million as of 2018. Even with this expensive price tag, though, Airbus has still managed to produce and deliver 226 units. With 550 square meters of usable space, the A380 is the world’s largest passenger airliner. In fact, it has 40% more space than the second-largest passenger airliner. This, of course, is a key selling point of the A380. Airbus touts its massive jet as being able to hold up to 853 passengers. The A380 isn’t just large; it’s also fast. While different variations have different speeds, the A380-800 variant has a cruising speed of about Mach 0.85. To put that number into perspective, it’s roughly 560 miles per hour (MPH). Designing and developing the A380 from scratch was no easy feat. It took Airbus’ engineers several decades to create the massive airliner, as well as more than $15 billion. Given the A380’s cost of $445 million per unit, though, it’s safe to say it was a smart investment for Airbus. 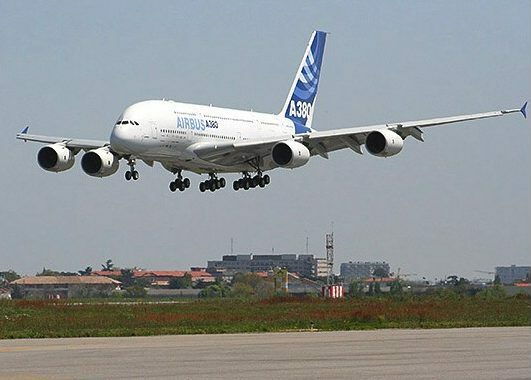 The A380 has helped Airbus cement itself as a leading aerospace manufacturer, giving Boeing a run for its money in the market. The A380 is offered in two different engine variations, one of which is a Rolls-Royce Trend 900 engine. This powerful engine provides the massive jet with the propulsion and lift needed to take off. The other variation is the Engine Alliance GP7000, which is also a powerful option for the A380. The A380 is unique in the sense that it’s one of the only commercial airliners to feature a frame consisting of at least 20% composite materials. The A380’s fuselage, on the other hand, is made almost entirely of aluminum alloy metals to achieve a lightweight yet durable design. According to Wikipedia, the A380 is the first commercial jet to feature a wing box consisting of carbon-fiber plastic materials. Why Can’t Planes Take Off When It’s Hot Outside? What’s the Deal With the Small Holes in Airplane Windows? Why Do Airplanes Travel in an Arc?